Loud rich song begins with a few clear whistles and is followed by varied short “buzzy” trills. Description: Sexes similar. Large and chunky. Plumage is highly variable. Most have reddish rump, tail, and wings; and whitish underparts that are heavily marked with triangular spots merging into large central breast spot. Varying amounts of gray on head and back. Heavy bill with lighter-colored lower mandible. Behavior: Forages on the ground by scratching in fallen leaf litter for insects and seeds; nests near the ground. Habitat: Brushy woodlands, edges of coniferous or mixed woodlands in dense undergrowth, streamside thickets, and occasionally residential areas. Where in Nebraska: Common to uncommon spring and fall migrant in eastern Nebraska, becoming rare or very rare in the west. 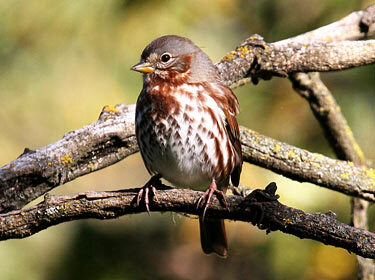 Fun Facts: Adult Fox Sparrows will feign a broken wing in order to lure nearby predators away from their nest.